With all the teeth present, there is stability. Teeth are not actually rigid in the mouth, but stay in place due to a complex series of pressure contacts and eruption forces. However, teeth do tend to shift over time. 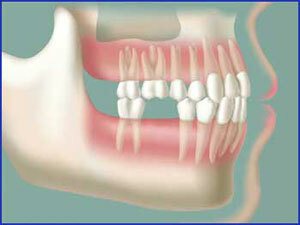 This occurrence is known as tooth drifting or mesial shifting. Shifting of the teeth occurs when teeth begin to crowd or there are missing teeth which causes the remaining teeth migrate or drift from its normal position. 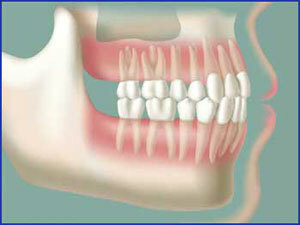 When you lose a tooth, the remaining teeth no longer have the support that the bone and missing tooth once provided. Because there is no longer support, the teeth begin to shift or move out of its anatomical position and into the open area. This causes those shifting teeth to weaken as well as be susceptible to further tooth loss. There are several options to prevent and treat teeth from moving out of place. In order to help prevent teeth from shifting, the only option is to wear a retainer regularly to keep the teeth in their normal position. However, wearing a retainer will not help treat it. Replacing missing teeth with a single dental implant or a single tooth bridge are common treatment options for teeth drifting. Our New Jersey / New York office specialists recommend dental implants to their patients. This options provides a natural looking and functional artificial replacement tooth. Dental Implants are metal rods that are surgically inserted into the jaw bone beneath the gums. Since the implant is fixed into the jaw bone, it provides support for the artificial tooth and does not become loose. We offer several dental implant options depending on the amount of missing teeth. If you are considering dental implants, you must have healthy gum tissue and sufficient jaw bone density to properly insert the implant. If the bone is too thin or soft, bone grafting may be required. If you suffer from shifting teeth, schedule your free consultation with one of our top rated NYC / NJ periodontists. Full mouth of healthy teeth. One molar is lost due to trauma or decay. Adjacent teeth can be pushed toward the empty space.